Roast dhal and chillies in little oil till golden brown. Keep aside. In the same kadai, fry the grated dry coconut in a spoon of ghee till crisp and brown. Be careful not to burn the coconut. Dry grind the roasted dhal, chillies and salt in a mixie coarsely. Now add the coconut and give it a whip. Store in an air-tight container. This can be refrigerated and used for fifteen days to one month. Shelf life is one week. Best with hot rice and little ghee. Hi. I make this too and love to have it with roti and oil. I first looked at the container shanthi, then my ever favourite thengai podi. Awesome! Aiyyoo...my favorite! I love to just mix this with rice and eat! Super Super! i love to have this with rice or hot rotis and oil. This will be great with rice too... Sounds very nice and tempting... Nice color!!! looks really good... a fav in our houses... so simple but so tasty..
Nice recipe. Nice picture too. Thanks for visiting my blog! You have a lovely space here. So many posts already too! Lovely recipes. Will add you to my blogroll. Take care! this thengai podi is my daughter's fav.longtime i wanted to make it at home.Somehow got missd.Looks so tempting.All i need is hot hot adais(!!) 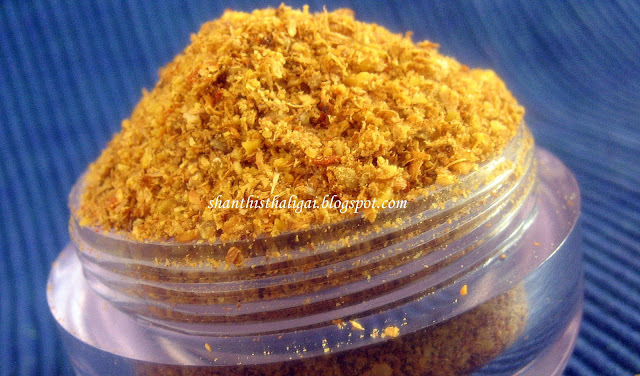 to taste this yummy thengai podi.Thats a lovely combo.